Dimensions 1.25 by 7.50 by 9.50 in. 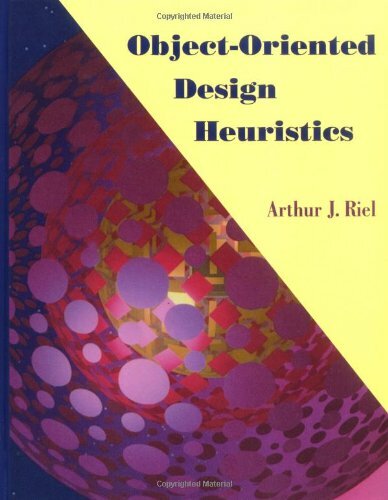 Amazon.com description: Product Description: Object-Oriented Design Heuristics offers insight into object-oriented design improvement. The more than sixty guidelines presented in this book are language-independent and allow you to rate the integrity of a software design. The heuristics are not written as hard and fast rules; they are meant to serve as warning mechanisms which allow the flexibility of ignoring the heuristic as necessary. This tutorial-based approach, born out of the author's extensive experience developing software, teaching thousands of students, and critiquing designs in a variety of domains, allows you to apply the guidelines in a personalized manner. The heuristics cover important topics ranging from classes and objects (with emphasis on their relationships including association, uses, containment, and both single and multiple inheritance) to physical object-oriented design. You will gain an understanding of the synergy that exists between design heuristics and the popular concept of design patterns; heuristics can highlight a problem in one facet of a design while patterns can provide the solution. Programmers of all levels will find value in this book. The newcomer will discover a fast track to understanding the concepts of object-oriented programming. At the same time, experienced programmers seeking to strengthen their object-oriented development efforts will appreciate the insightful analysis. In short, with Object-Oriented Design Heuristics as your guide, you have the tools to become a better software developer. About: Object-Oriented Design Heuristics offers insight into object-oriented design improvement. About: Here is the first object-oriented development book to provide specific experience-based guidelines to help developers make the right design decisions.